At $8,000, Would You Wanna Try This 1991 Honda Civic Si on For Size? Today’s Nice Price or Crack Pipe Civic has 233,000 miles on the clock. The thing of it is, not a one of them really shows. Let’s see if this super clean hatch can get a buyer to show up with its asking. You wouldn’t finish someone’s restaurant meal for them after they’ve gotten full half way through, would you? You’re equally unlikely to complete the consummation of wedding night conjugals should either bride or groom tap out before the big finale, it’s just not done. Also, eww. What you might do however, is pick up where a previous owner left off in the reconstitution of a great old car, and that’s just what was asked of the prospective buyer of yesterday’s 1985 Porsche 928 S. It looked good from far, but with a litany of niggling problems still bedeviling it, it was sadly looking far from good. Still, a five speed transmission and clean interior were enough to push its $8,500 asking to a 54 percent Nice Price win. Yay! Now, take the reins! If that project Porsche seemed a compelling package at its $8,500 asking, what do you think will be the fate of this seemingly problem free 1991 Honda Civic Si which is asking a substantial five Benjamins less? Yes, it’s true that former comes from one of the most lauded sports car makers on the planet, and features some of the coolest headlights ever to pop an up. The latter on the other hand, represents little more than a slightly hotter edition of your basic sensible econobox, and its headlights are nothing to write home about. Still, I think the Si is the buy. 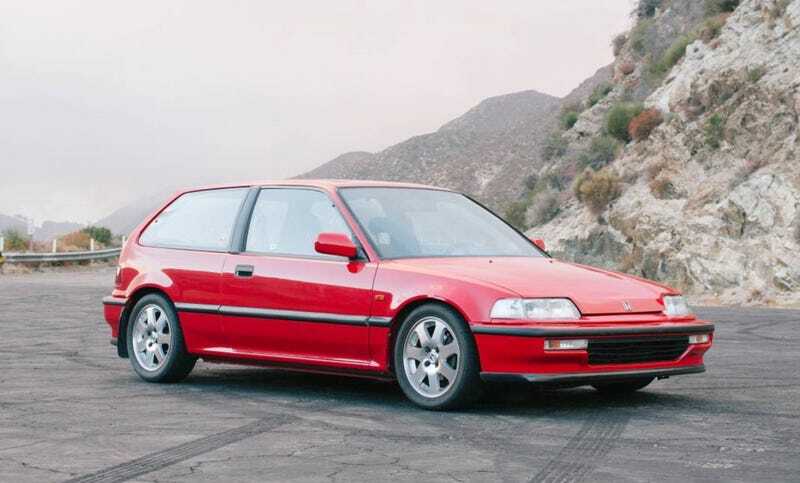 The fourth generation of Civic, which ran from late 1987 through the 1991 model year continued a trend started by its predecessor. That meant a quartet of body styles each built around a super low platform. It was like they were channelled right at the factory! This was before pedestrian safety was given all that much consideration and so the hood on this Civic is able to sit amazingly low compared to that of today’s Civic. It also sports a real shooting brake style hatchback body, and super clean styling, aesthetics that escape the current Civic as well. That was all made possible by a double wishbone suspension at each corner and super squat firewall. The result is a car that still looks unique, and dare I say it, excellent today. Add to that the subtle bumper extensions and alloy wheels of the Si and you’ve got yourself a pretty slick little machine. A 108 horsepower D16 SOHC four and smooth shifting five speed helped to put the walk behind that talk. That 1590 cc four is claimed rebuilt in this Torino red over black Si and that helps to mitigate the 233,000 miles showing on the car’s odo. Amazingly, the refreshed mill and the odo barrels are the only clues to this car’s age and its distance driven. The rest looks as fresh as the prince of Bel Air. It’s a California car, a plus when it comes to potential road rot (there’s none) and weather damage (ditto). In fact, it apparently lives just a couple of cities over from my own humble abode. Oh dear! The pictures in its ad were taken up on Angeles Crest, a sinuous mountain road that carves its way through the rugged San Gabriels, and is the haunt of sport bikes and cars with purpose, like this Si. The bodywork is clean and the interior amazingly even more so. The car rides on later EM1 alloys and sports Koni dampers and Eibach springs tucked in behind those. In addition to the rebuilt D16 the car comes with a new cat and behind that an aftermarket exhaust. If you can level a single criticism at the car and its manager, it’s that the exhaust tip is a bit ostentatious. A smaller outlet would be more appropriate in my opinion. It’s remarkable how inviting the interior appears. A Momo steering wheel faces the driver and a later head unit offers up the tunes. Being a ’91, this Civic comes from the era of passive restraints before airbags were a thing. That means passive belts, but thankfully Honda built them into the doors rather than as a two-piece mechanical system. With the door mounted belts you can use them like you would normal units. The car comes with a clear title and receipts for the work the present owner has commissioned. That owner is asking $8,000 for the car and you now need to decide if that’s a price worth paying. What do you think, is this Si worth that kind of cash? Or, is this a Civic that’s priced uncivilly? H/T to Twowheelsev (again!) for the hookup! How About This 1983 Honda Civic S For $3,000?